I have been in the vacation rental business for 20 years and LOVE what I do. Some of the homes in Maggie Valley on VRBO are owned by me and my husband, and I manage others. I am so fortunate to live in these beautiful Smoky Mountains and I enjoy helping vacationers by sharing my knowledge of the area. 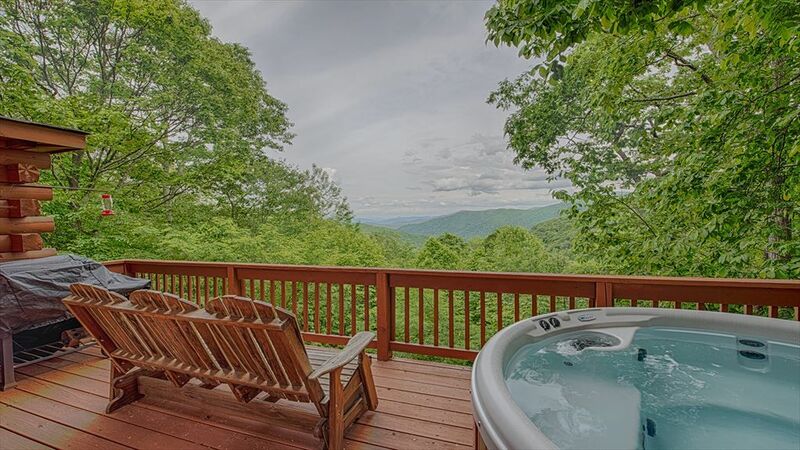 Because it is just miles from the Blue Ridge Parkway, Smokey Mountain National Park, shopping in Waynesville & Asheville, and the elk at Cataloochee. The view is magnificent any time of year, and even more so in the fall when all the colors are changing. What's unique about this home is that you can play ping pong and foosball in an open loft. The view of the mountains is simply breathtaking from there. We had a wonderful stay! We saw elk very close to the cabin one morning. The view was exquisite. The sunrise and the moon views were especially spectacular. The drive to the cabin was an adventure, but nothing too extreme. We enjoyed walks on the one lane roads. The person before us did not leave the correct key, so we had to wait about 30 minutes for someone to bring us a key, which was a little inconvenient. My sons, however hopped in the hot tub immediately and my husband and I enjoyed the view while we waited. The basement and garage area did not smell good at all. I'm not sure what the smell was, but it was quite unpleasant. The rest of the house was clean and well maintained. We enjoyed the game tables and had a wonderful time here. I would definitely recommend 4WD or AWD with some ground clearance. I will also add that if you are looking for a place to stay that has LOTS of things to do nearby, this cabin is probably not for you. If you don't mind a short drive (up to an hour) there are lots of activities. If you want to relax and enjoy the mountain view, this is definitely your place. We appreciate all feedback and are always happy to hear about good experiences. The key situation was simply a mistake made by the guests who had just checked out (their own house key looked just like this one!) and they left the wrong one in the lockbox. Unfortunately we were unaware of this until this guests arrival. We also want to make sure that potential and future guests are well-informed regarding the basement. It is NOT a finished basement and serves as only a garage and laundry area therefore it is not a space where you would be spending time. We will however, look into where the odor is originating to hopefully eliminate it. We stayed during and after Hurricane Florence, so we were worried about getting to the cabin based on prior postings about the driveway, etc.. Folks, this is a mountain house. Your driveway is not going to be flat. However, a 4x4 is suggested for the entire trip up the mountain as the short or the long way still requires some patience. Once you get to the house, it is as described. Well kept, good view.. room for 6 if needed. This house was beautiful and the views were indeed awesome! We have already discussed returning to this great house. Be warned- the internet is slow, and you aren’t allowed to stream movies or music! We did not anticipate that, but took it as a welcome opportunity to disconnect. We had a wonderful time. The cabin is beautiful and very clean. Thank you so much! We had a blast!!! The cabin is nice. However, the driveway is dangerous. My car ended up with two wheels off the driveway because the wheels were spinning. Don't rent unless you have a four wheel drive vehicle. We always appreciate feedback from guests. As anyone can see in the headline for this home, we recommend 4 wheel drive vehicles and always have. Not only is this in the advertisement but we also make sure that anyone renting this home understands this upon booking. Additionally, alternate directions are provided at booking for an easier route which can be accessed with a two wheel drive vehicle. We have personally taken a Honda Civic to the cabin. As we're pleased to know that this guest liked the cabin, certainly an issue such as how difficult they deemed access to be shouldn't amount to a one star review given that we provide full disclosure. Gourmet Gifts from the Smokies - Delicious Peanut Brittle!